Ronnie Walter served as an account executive for a direct marketing agency in England for several years, sold commercial graphic services and was the art director for a stationery company in Minnesota. In the early nineties, she decided to freelance as an illustrator and licensing her art on greeting cards, stationery, and giftware. Now with hundreds of products under license Ronnie is able to bring her brand of humor to thousands of people. She began her licensing work in 1994, and in 2000 joined her husband, Jim Marcotte, a successful business owner, in forming the licensing agency Two Town Studios. 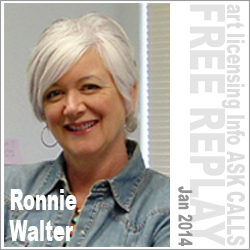 Having a foot in art licensing as both an agent and an artist, Ronnie shares some very insightful perspectives on the industry at large, mistakes artists make, royalty rates versus flat fees, cold calling and negotiating deals. She also offers her Five Things to Forget About in Art Licensing list.